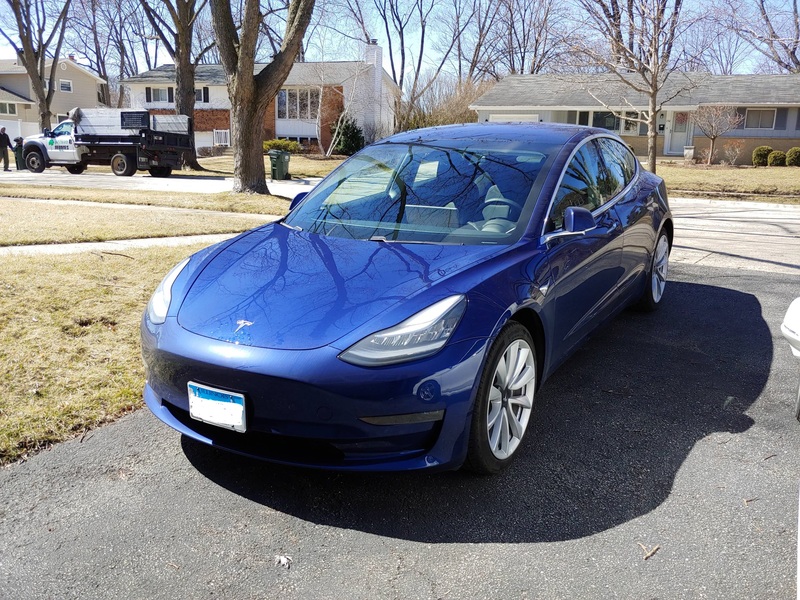 A few weeks ago I purchased a Tesla Model 3 as my daily driver. A week ago I sold my Accord so I'm officially out of the family. For those that are on the fence regarding electric vehicles (or anyone else for that matter) I highly recommend researching the Model 3. At first I was pretty sold on the Hyundai Kona but they have severely limited the availability. Charging was also going to be a bit of a pain. After reading about the Model 3 I bought one online, a Blue Long Range RWD (currently not being sold). It's very different from owning a gas vehicle, it's nearly a lifestyle. I didn't enjoy driving my Accord after I picked up the Model 3 - the cold engine and transmission were rough, having to wait for the engine to warm up to get cabin heat, having to use the brakes to slow down. It sounds silly but the Model 3 is a complete departure from what every other auto manufacturer is doing. They built it from the ground up, questioning every aspect of how people interact with their vehicles, and it makes a lot of sense. Not to mention their autopilot software solution (which I'm on a trial currently but I'm falling in love). The supercharger network is excellent and IMO is totally necessary if you plan to take the car on road trips, which I have done twice. Unfortunately it doesn't make much sense to own one if you don't own a home or have access to an EV charger in your parking lot. Over the air updates are a godsend. Since I bought the car I've received a 5% boost in mid range power and sentry mode which records on three cameras when someone gets too close or damages your car. I have to stop myself here, I could write a book about how much I enjoy driving this car. The company might be a bit of a mess, but they've developed a car that has and continues to drive consumers from traditional ICE vehicles into EV's. In the next few years we will see new dedicated EV platforms from large auto manufactures. Hopefully Honda will commit as well. Although I like the Model 3 much more than my Accord, I did learn a lot from the members here. I will miss the community and wish you the best! MackDaddy, Markus, salcuta and 1 others like this. Interesting! Good luck!! Hope it holds up and as long as you are happy, that's all that matters! Tesla is not my type of car. It looks like a ladies car. Actually, my wife is planning to get the Y model SUV in the next 2 years or so. I am happy with my V6 eventually if I sell it I will look for Honda new innovative technology before checking others. For me, Tesla will be the bottom of my list just because of the looks it looks ccc to me.. Here is a comparison of looks. I will rather go for type R rather tesla.. I am from the bay area, and teslas are practically on every street its become a cult. To me, I am sick and tired of seeing those things. If I were to spend large amounts of money on a car, I would pick something a bit more rare. Nonetheless, congratulations on the new car! Hope you make the most of it! A few years ago, I would never have considered an EV. Too expensive, not enough range, limited selection, etc. Tesla, however, aside from building amazing, but unreliable electric cars, have really shown the public what an EV will be like in the future. Now, I plan on keeping my Accord for the next 13 or 14 years and I'm pretty sure my next car will be electric. I'm quite certain that in 15 years electric range will be in the 450-500 mile range and a full charge can be done in a half hour. That's just where the technology is headed. I'm also quite certain that every manufacturer will be producing more EV's that ICE powered cars. It is my prediction that, in 15 years, we will be taxed quite significantly for buying an ICE car. I mean, is Honda even going to be building an ICE Accord in 15 years? Let's face it, the future is electric. Best of luck with the Tesla. Electric is the future but I don't think it's mainstream enough just yet but it will be. Hybrids have finally come to the point where they have decent performance and price so I think their time is now before pure electric offerings dominate. Tesla as a company though seems to be a mess and I just don't see an electric as a daily driver until the network infrastructure is there. "I bought one online, a Blue Long Range RWD (currently not being sold)"
Thanks everyone. The prices aren't that bad when crunching the numbers, features and performance. It's a "luxury" class vehicle, and if you drive less than 180 miles a day, which most people do, you can get the Standard Range Plus for the price of a 2019 Accord Touring. $2000 cheaper if you order at a showroom and remove autopilot from the price. Not to mention years of gas savings and the benefit of new features and bug fixes being applied to the car. If I didn't have the ability to charge at home AND have access to a gasoline vehicle I would have kept by Accord (my wife has an Escape). Reliability seems pretty good, the car is much, much more simple than a standard ICE or hybrid vehicle. The eight year battery/powertrain warranty helps ease the worry, and battery life reports from the older gen batteries in the Model S make me worry even less. I paid extra for the Long Range because I occasionally take trips down to Louisville from Chicago. I have to stop for 20-30 minutes to charge in Lafayette and regain 200 miles of range, meanwhile I get some food nearby and wait for the phone app to tell me when it's time to head back. It's not difficult to fit a Tesla (or any other fast charging EV) into a lifestyle, especially if you live in a metropolitan area. Cost too much and from what I've read they're crap vehicles. And with the $45k I save I can put gas in my 7th Gen til there is no more gas. 2004 Accord EX I4 MT (wife's), totally bone stock except for all the crap that fills every cubic inch that is not the driver seat. 2005 Accord EXL I4 AT 2/Navi (kid's), totally bone stock. With electric car I always have to make sure it is fully charged when I leave in morning. With present car what ever the fuel level I have I leave and can stop at any gas station to fill up in 5 min. thats called peace of mind. Why I pay 45K plus to sell peace of my mind actually I am paying Tesla to take away peace of my mind ..LOL. Other thing every time I go for long drive I have to follow Tesla route to find charging station it is not 20 min break it is control by Tesla our freedom to explore while travelling. So in Tesla case you are stuck with the route where there are electric charging station. Also thinking of future when there will be more car on roads you can not find the 20 min as there will be a long line for car waiting to charge and each car charging for 20 min then your wate time = waste time will be an hour or more..enjoy... I favor hybrid though..
That's the beauty of the electric car, no more gas station stops. You plug in when you park, it takes 5 seconds and you're fully charged the next day, that is peace of mind for my daily driving. Charges from 10-90% in less than eight hours at home. You can see how many stalls are being used at the supercharger before you arrive. I will never need to charge unless I'm on a long road trip. In which case anywhere I go has a supercharger strategically placed right off the interstate. Congratulations. I'm glad the Tesla is working out well for you. EV is the future, so you're ahead of the curve. I imagine that there are convenient supercharger stations in Chicagoland. For those living in the "sticks" like me, I think the charging options are limited. It all depends on the life style. For most people the car shouldn't dictate how we should live our life style, the car should work with it. I think electric cars will have their place but I believe hybrid is the way to go "best of both worlds." First it was keeping the phone charged, now its the car. I wonder how is the range affected by colder climate? The past polar vortex was something else. That's what exactly I tried to mention in my post. Freedom is a great thing. Tesla or present EV will dictate your lifestyle. Yes, I will buy it if I do not have other options. But as I have to keep me free to drive and fill gas any time anywhere so I will wait till better battery life. I am not seeing this to happen in the next couple of years for daily driving. Especially in rush hour with AC and heater ON the battery life definitely will be short. Then you have to be sitting on the edge to find the charging station. I can write the whole book on this but hope they understand what is freedom and what is control. That's why I favor hybrid till we have at least with one battery charge 400 miles like with gas and fast charge to 50% in 5 min. ALso, those who think luxury please drive es 350 you will find that more luxury than Tesla. I already tested it. It is just publicity. It has more road noise because no engine makes road noise more prominent and kind of annoying.